...Cyber Streets that is. Here we have four young guys stepping out into the world and looking good doing it. Let's meet the crew shall we? 1. What does style mean to you? In my opinion style is simply a artistic self-expression. I believe clothes are the paint and your body is the canvas. Everyone has their own sense of style whether it be, prep, street, chic etc. It's all about who you are as person and what you gives you confidence. 2. 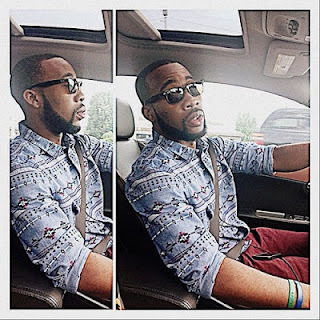 What are the top 3 items every gentleman should own? A Navy Blue Blazer, a nice pair of jeans, blue oxford cotton button down and brown oxfords would be a great way to start off. Each piece can be mixed and matched and can also be worn in a work or casual environment. In a quick and short definition, STYLE is defined as "a mode of fashion", but for me, style is more than a mode... it's a lifeSTYLE. It's about finding yourself, and making others listen and take notes. 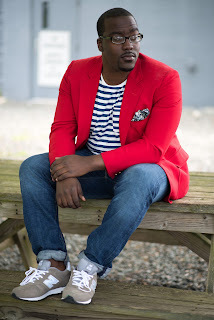 I have not always been a lover of fashion, but after being drawn into the world of accessorizing by my fabulous lady love, I found myself looking in magazines and checking out blogs... longing to learn more about fashion, trends, and others lifeSTYLES. My style comes from my life. The activities for my day determine my dress. Whether it's work time, beach time, date night, or laundry day, I dress for the occasion, never forgetting to add my special spice... ACCESSORIES. From sunglasses to watches, bracelets to Polo caps, my means of accessorizing helps to transform a basic outfit to one worth taking another glance. Style to me means living... living through life, experiences, clothes, and last, but certainly not least, fashion. 2. What are some ways guys can incorporate more color into their wardrobe? I believe color is all about taking risk. 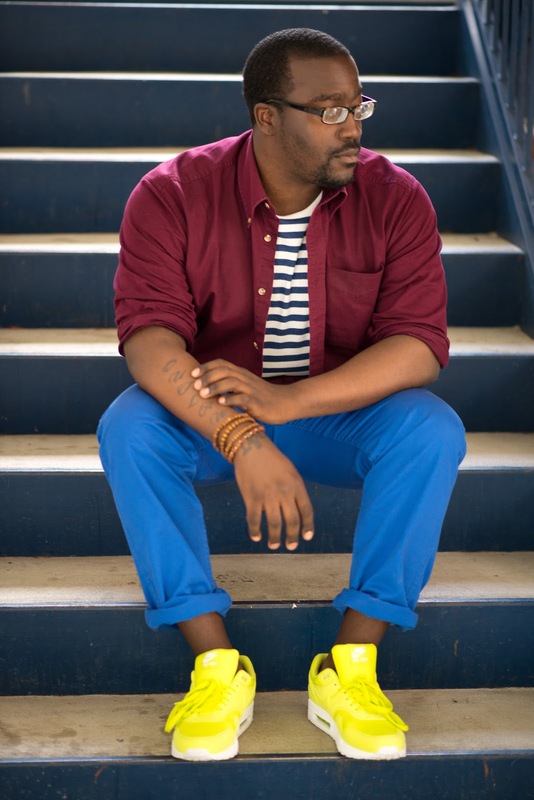 It's about breaking away from your normal blue jeans and white v-neck, and diving into those "out of my comfort zone" colors. For me, incorporating color came in seasonal stages. Purples, oranges, and reds in the Fall; lavenders yellows, and greens in the Spring. It's easy to grab a colored shirt... the challenge comes with colored bottoms. Before my big fashion transformation, I only owned blue jeans, black jeans, khakis, and one pair of plaid shorts. Now, I own shorts and pants of every color, and I am constantly on the look out for the next pair. A wise woman once said, "Choose to wear things because it looks good, not because you do or do not like it." It took a while for me to understand what she meant, but when I finally got it, it made sense. I wear flat front pants and skinny jeans because they look good on my frame. 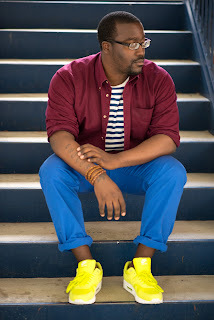 I wear bold and pastel colors because they compliment my dark skin. 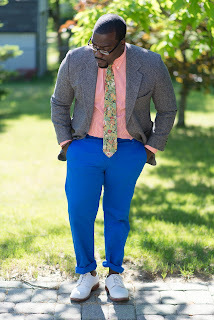 My advice to guys looking to add a little zest to their wardrobe??? Find a woman... girlfriend, best friend, no matter... and let her help. Be open to her opinion, and listen to what she has to say. We all know, "Women know best"... and I have learned that fashion is no exception that saying. I draw my inspiration from my girlfriend. Honestly, she's the real fashionista, and the person who got me intrested in fashion. She's the one who taught me all of the do's and don'ts and really gave me a foundation to build an amazing wardrobe around. I work in a women's clothing store, and I get to see all of the trends first hand. Women's fashion is so much more dynamic than men's fashion. It's ever evolving with new combinations of color, patterns, and textures. It makes me envious that men's fashion isn't as daring yet. 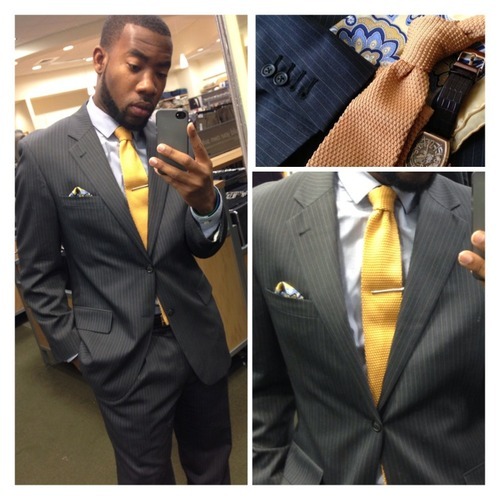 Men's fashion is all about sticking to the basics and adding in some flair once you've developed a working knowledge. I just so happen to borrow much of my flair from women's fashion. 1.What does style mean to you? Style is simply your interpretation of fashion. It's a way to express who you are as an individual without say any words. 2. 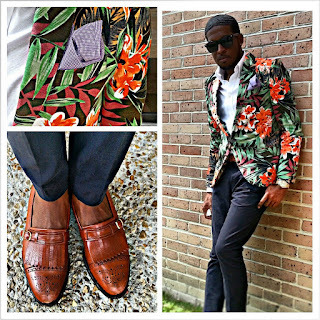 That floral blazer is niiice! 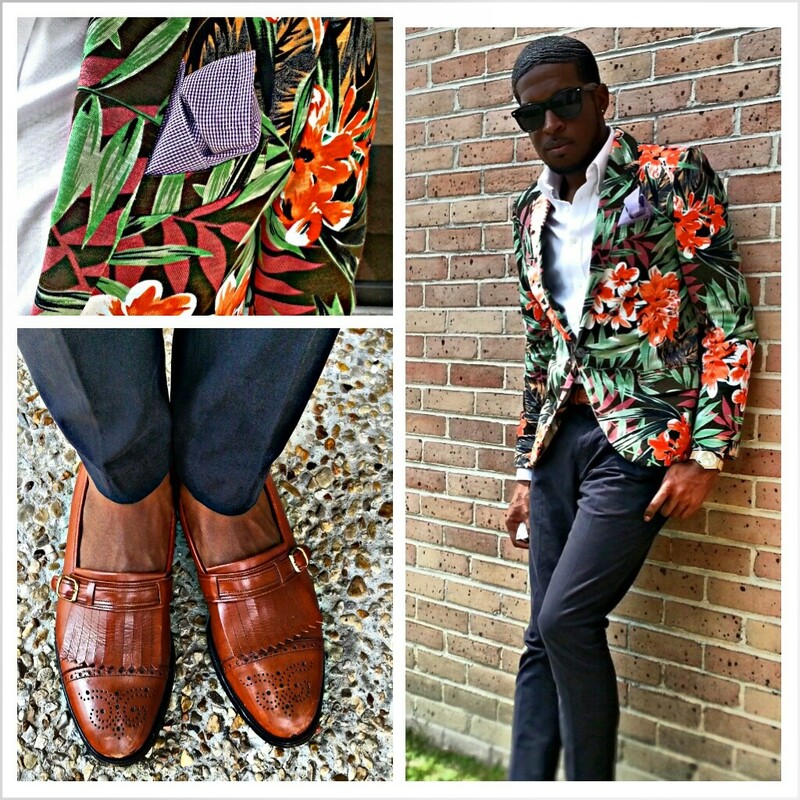 What advice can you give to men who want to step out of their comfort zone and try a bold print such as floral? Men it's the 21st century! It's a new day! Don't be afraid to add some color to your wardrobe. Bold prints are here to stay for a while, so we might as well embrace this trend. If you want to make a statement, try a bold print. The world is evolving! We as people are more appreciative of situations that were taboo in the past. 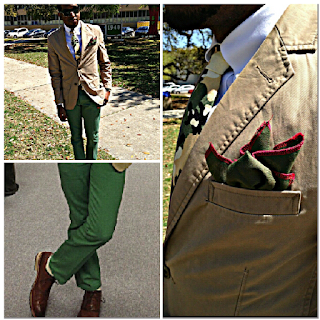 Men's fashion is blooming, reason being, we have a better conscious of what we wear and open to new things. So, now is the time to experiment! 3. I know you don't what to give away all you're shopping spots (lol), but would you mind naming a few? I have no problem with that! Hahaha. To name a few of my spots: Zara, H&M, Asos, High End Resale Shops, Mr.Porter, and of course Thrift Stores! To me style can mean a lot of things, style can more then just putting on nice clothes. Style is about having your own specific trend, your own uniqueness that brings out your day to day mood. It don't really matter if its popular or not, as long as it make you feel good by wearing it. 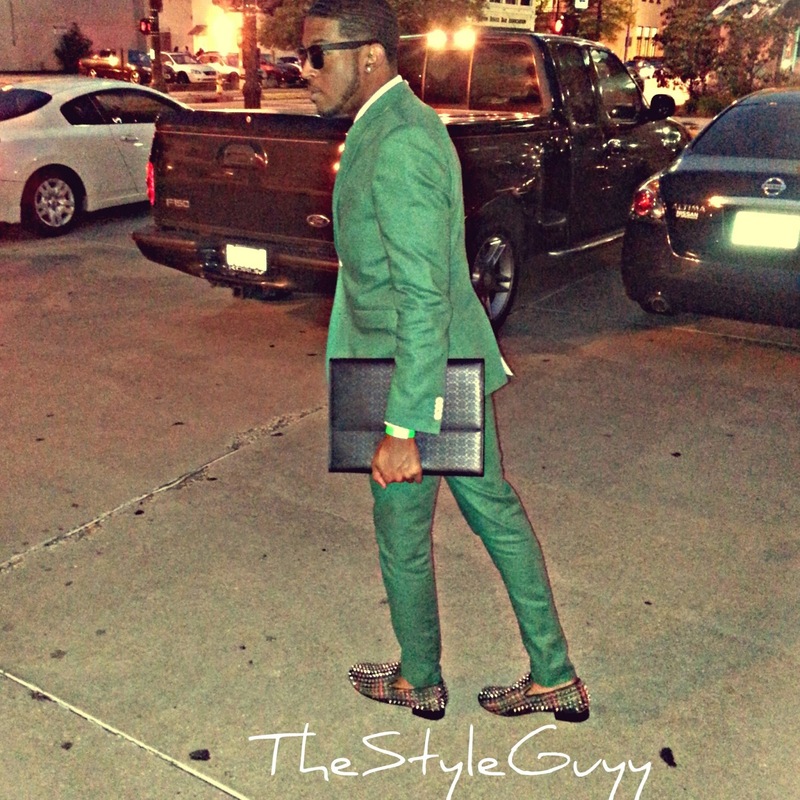 Your own style or trend can be a lot of things like footwear, accessories or clothing. Pretty much anything that can show and explain your personality without you saying a word. 2. What outfit do you always find yourself going back to? I always find myself going back to wearing shirts, ties, suits and dress shoes. I like the casual look but every now and then I find myself putting on a nice button up or shopping for a nice blazer or sport coat. 3. What's your view on backpacks vs. briefcase? Me personally I wear backpacks, the 2 straps classic JanSport backpack. It might not be that fashionable but it do the job on a casual day just going to class. You will normally see a briefcases or messenger bags on days when you might want to dress it up and wear business type of clothes, suits and things like that. 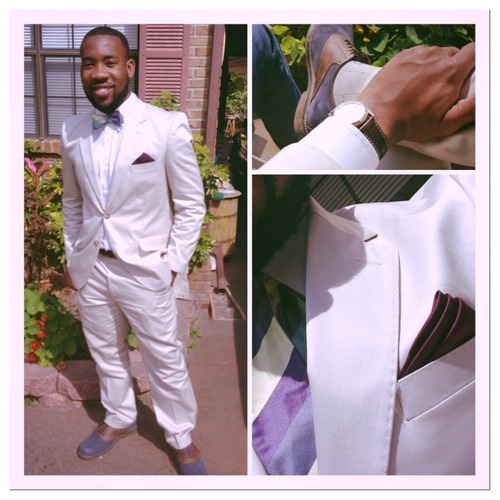 There you have it, style speak straight from the mouths of some of the most dapper men I've seen. You can follow these guys on their Instagram tags provided for more amazing photos as well as stylish threads.